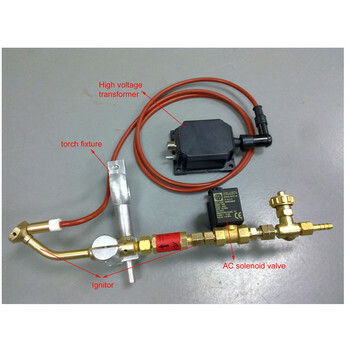 HYD-IG-100B Auto ignition system is a creative and unique gas ignition device developed by Shenzhen HYD.CNC Technology Co., ltd, which is mainly designed for CNC oxy-fuel cutting, but also can be used for other fields needing auto ignition. The unique feature of this new igniter is…igniting without gas supply, saving cost greatly; with 100% ignition efficiency, no carbon collection, no interference, simple installation and maintenance. It will be a perfect replacement for conventional ignition system. When input DC/AC24V to pull-out electromagnet, the electromagnetic transmission pulls the high volt connection device’s transmission to torch tip around 13mm. When it gets to the position, the power converter pcb offers a DC24V to high volt transformer, enable it produce a rated frequency Flash High Voltage, and this high voltage produces Short-Circuit Arc between electricity releasing needle and torch tip. At this time, the high volt transformer’s output drops to around 600V, because of the constant current control in high volt transformer. At the rated frequency( this high volt transformer works different from conventional ones on market), this Short-Circuit Arc can last a short time that enough to ignite the gas.